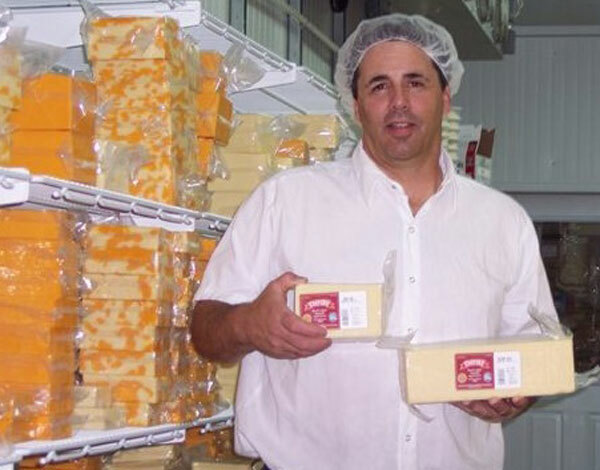 Cheesemaker Mark Erwin with two first-place cheddars. (Photo by Rebecca Crosgrey. Even though it was up against Canadian cheese giant Agropur, Empire Cheese & Butter Co-op won two firsts, two seconds and two thirds in the cheddar competition at the Royal Agricultural Winter Fair—the best showing by an artisan producer. In fact, Empire’s Mild Cheddar was named Reserve Grand Champion in the judging, runner-up to Agropur Grand Cheddar 2 Year. Empire Stilton Shaped Cheddar – Third in class, Stilton Shapped Cheddar. Maple Dale 2 year – Third in class, Extra Mature Cheddar. Ivanhoe Cheese of Madoc, Ontario, won second in the Extra Mature Cheddar class with Ivanhoe Classic Cheddar made May 15, 2011. Four of the seven cheddar classes were won by Agropur, one of Canada’s biggest co-operatives owned by 3,400 dairy farmers. Among its 15 dairy divisions is Oka, Canada’s iconic cheese brand that dates back to 1893 when Trappists made it. Yes, indeed! We are splitting coverage of the Royal Winter awards in three parts. Stay tuned.